Click on a thumbnail above to view a larger version at right. An odd shot, perhaps. But I wanted to find a way to illustrate how many of us start our days with a cup of coffee and then head out toward destinations unknown. This is a defining photo for me, because it reflects a shift in my own thinking. 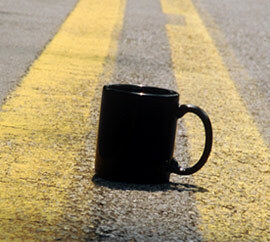 These days each journey I take begins with a strong cup of trust. Wherever I'm going, I'll get there. A friend of mine suggested I come up with a show that spoke directly to the clientele of the places hosting my exhibits. At the time, I'd been exhibiting mostly in coffeehouses so I knew I'd be working with coffee. But I wanted this exhibit to be more than just six pictures of coffee cups and beans. I wanted the images to be simple; I wanted them to be as creative and spontaneous as possible; I wanted them to tell a story of reflection, appreciation and cohesion. It looks like it worked. The show turned out to be one of my best-selling exhibits as it rotated among venues in Atlanta two years ago, and continues to sell in print or postcard form today.